Coronation Chicken is a great way to use up leftover chicken. The dish is lovely served with a rice salad, as a jacket potato filling, and great for lunch boxes, picnics, and buffets. How versatile and how easy to make. In a frying pan, heat the oil to hot, not burning. Add the onion and cook over low heat for 3 to 4 minutes. Stir in curry paste and cook for 2 more minutes. Stir in the tomato paste. Remove from the heat and stir in the red wine, chicken stock, and bay leaf. Season with sea salt and black pepper, return to the heat, and bring to a fast boil. Stir in the sugar, followed by the lemon juice, and simmer on a gentle boil for 5 to 10 minutes. Strain the sauce through a sieve into a jug and leave to cool. Slowly add the curry sauce mixture to the mayonnaise. Do not do this too fast, as you need the sauce and mayo to be thoroughly combined. Next, stir in the apricot jam, and finally, fold in the cream. Place the cooked chicken in a large bowl and pour over enough sauce to coat the chicken. Any remaining sauce can be frozen for future use. Taste and adjust the seasoning. Serve the Coronation Chicken with a rice salad. It also makes a delicious filling for a baked potato. Use in sandwiches or even stuffed into pitta bread. This recipe also works well with cooked turkey. The dish was designed for the coronation of Queen Elizabeth II in 1952 as a representation of the, then, colonial nature of the British Empire, so it includes fruit, curry, and mayonnaise. There may no longer be a British Empire, but this recipe remains a firm favorite all over the British Isles. 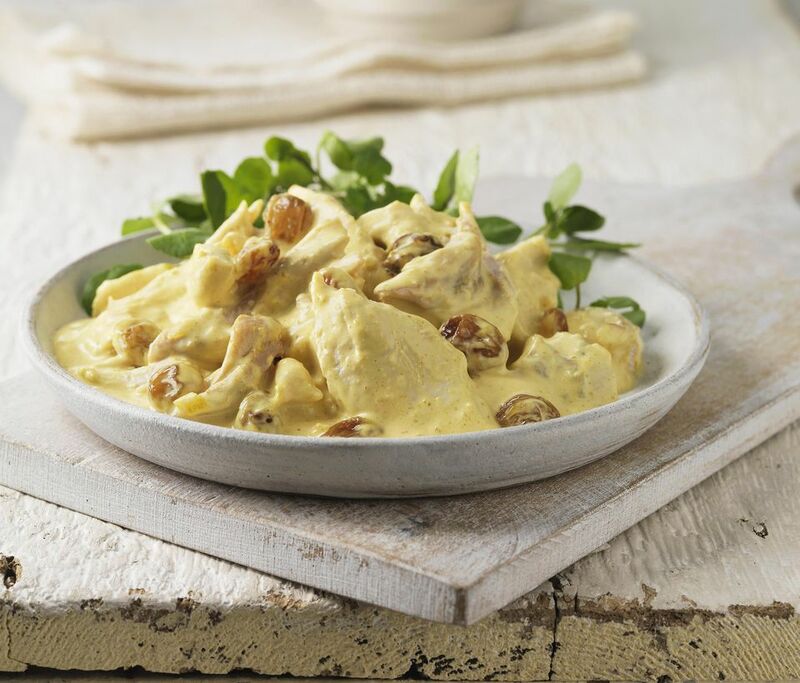 Coronation Chicken has made something of a comeback with a resurgence of interest in serving it at the Queen's Diamond Jubilee in 2012, when street parties and celebrations mark the Queen's 60 years on the throne. It was a fitting time to bring back the old classic.